For when a normal holiday just won’t cut it. Generally speaking, hotels are places we stay in when we’re exploring new cities. But what if the actual hotel was a vacation destination in and of itself? There are so many unusual accommodations around the world (you can even stay in a renovated air control tower) that it seems a waste of a trip to stay in the same cookie cutter hotels time after time. Here are some of the most unique hotels in the world to add to your travel bucket list now. This futuristic-looking (and Instagrammable) hotel is the brainchild of architect Antti Lovag. 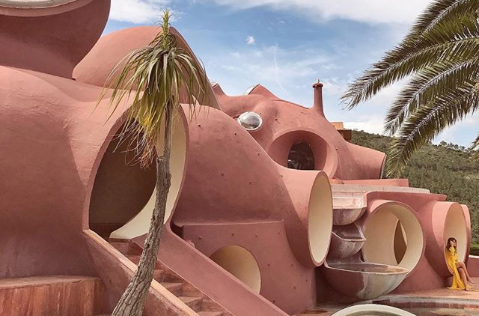 It almost looks like millennial pink fungus is growing off the side of the cliff in this French beach town, but the labyrinth-like structure is a must-see for any design fiends visiting the Cannes region. With pools providing an uninhibited view of the surrounding sea, Le Palais Bulles coincidentally also makes an ideal summer retreat. You know when you check in to a hotel, go down for breakfast, and think, “The experience of eating this omelette would really be ameliorated with a giraffe or two?” Well, ask and you shall receive: The Giraffe Manor is part exclusive boutique hotel, part giraffe sanctuary. Guests can feed the endangered Rothschild’s giraffes that roam the property and interact with them up close. Just be sure you know what you’re getting yourself into—seeing a giant giraffe head poke its way into your bedroom window, demanding to be fed, can potentially be quite disconcerting if you didn’t expect it. Nestled in the southern Andes, this lodge looks like it’s straight out of The Hobbit. There’s a waterfall that starts at the very top of the volcano-like structure and goes all the way to the bottom, and the accommodation itself is only accessible via a swinging rope bridge—definitely one for more adventure-prone travelers, but an unparalleled experience. Montaña Mágica Lodge is hidden in the middle of a 300,000-acre private nature reserve so that you really get the feeling of seclusion, but with a list of amenities that includes everything from zip lining to hot tubs, you won’t be missing modern luxuries, either. After picking up a military-grade helicopter at an auction in 2016 (as one does), a Scottish couple completely renovated it into a holiday home that can sleep up to five people. The outside of the helicopter was restored to its former glory, but the inside has been expertly decorated with contemporary pieces in a light color palette, making it a welcoming and cozy place to stay. Evidently, renovated air vehicles are all the rage these days: If a helicopter isn’t quite your scene, you can also stay in a refurbished Boeing 727 airplane. Hotel Costa Verde is a two-bedroom retreat that features a stunning all-wood interior, located in an actual jungle canopy. And it goes without saying that the view is incredible. Potentially the most stylish treehouse in existence, the Watamu Treehouse is accessable only by a sandy path through the woods, two minutes away from the beach. The distinctive architecture is the brainchild of Kenyan stained glass artist Nani Croze, whose mosaics can be found throughout the hotel. Each of the seven bedrooms is different, in order to ensure that visitors get a truly unique experience during their stay. Stay in an igloo with the added comfort of knowing the snow roof is not going to collapse on you while you sleep. Rent a glass-walled igloo and take in the peaceful Finnish landscape. There’s even a larger Northern Lights house, so that you can witness one of the biggest natural phenomenons in a luxury holiday villa. The world’s first salt hotel, everything from the walls to the furniture is constructed using salt from the world-famous Salar de Uyuni salt flats nearby. The 30 rooms are all styled simply, but with the attention to detail expected of a luxury hotel. Visitors also get to experience the salt flats for themselves, as the hotel offers panoramic views of the largely empty Bolivian desert for a truly relaxing experience. This famous hotel was built in 1989, and has been reconstructed yearly each winter since. Following the summer’s melting of the previous hotel, artists and architects rebuild it into warm rooms and cold rooms at the start of the colder seasons. Looking for something a little more established? The permanent main house (Icehotel 365) includes luxury suites, art suites specially sculpted by artists, and an ice gallery. These accommodations are not for those with a fear of heights: Ninety minutes from Cusco and eight miles from Machu Picchu, these are the perfect rooms for adventure lovers. You climb up to your slopeside pod in a harness, and your food goes with you in your guide’s backpack. The interior decor is minimalist and functional, since the exterior sweeping views are the main attraction in this unconventional hotel. If you’re looking for privacy, this floating underwater hotel in Sweden is the right place for you. Located in the middle of a lake, Utter Inn is actually an art installation by Mikael Genberg that features an upper level and deck. The real draw is the underwater accommodation, however: The single bedroom offers windows on all four walls, three meters below the water’s surface. Admittedly, this isn’t exactly the tropics, so don’t expect amazing vistas—but if you’re in it for the unique experience of sleeping underwater, be sure to check it out. This story was originally published on July 22, 2017. It has been updated with new information.